The Fort Wayne Westies is a West Coast Swing club in Fort Wayne, Indiana that aims to promote authentic West Coast Swing as it’s taught, danced, and competed around the world. The club aspires to establish a thriving community of dancers that seek to learn WCS, “be a part of something big,” and build fun memories with their peers. Our community consists of dancers from Fort Wayne and surrounding regions, drawing inspiration from existing communities from all over the world that are strong advocates for the authentic West Coast Swing. Our club is open to dancers of any skill level, from never-danced-before to advanced dancers. We provide opportunities to learn and master West Coast Swing while having a great time and making new friends. Join us and be a part of something amazing, fun, and challenging! Check the tabs to the side to get started. Click the tabs below to learn more about our events. 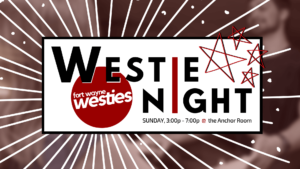 The Westie Night is a recurring West Coast Swing dance event in the Fort Wayne area with an opportunity to learn, practice, dance, and socialize! You don’t need a partner or any prior experience to participate! Every Westie Night is accompanied by an all-levels West Coast Swing group lesson at the start, followed by over three hours of social dancing to music dedicated to the genre of dance. WCS music is highly versatile, mixing in modern and classic music, multiple genres, and has a lot of variety throughout the songs. Many songs that are played at West Coast Swing dances can be danced to other styles like Cha Cha, Rumba, and more. Our Westie Nights take place on one Sunday and Saturday of each month, usually at The Anchor Room Dance Studio in Ossian, IN. This event costs just $10 for the entire night, including both the group lesson and the social dance – even if it runs well past the scheduled “end time”! We’re all fans of West Coast Swing and dance and it’s not uncommon for our dancers to stick around past the end time, simply because we love West Coast Swing so much – and love to hang out with everyone. 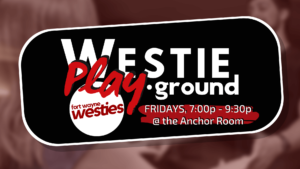 The Westie PLAYground is a weekly recurring event where first-timers and experienced dancers meetup in a casual, friendly, and social environment to learn, discuss, practice, and dance West Coast Swing. This event is open to all levels – including absolute beginners! Most dance events don’t give dancers an opportunity to specifically practice, break-down what they’re working on, or experiment with their peers. The Westie PLAYground is designed intentionally to give you the space and time to learn, practice, and experiment in a casual environment. PLAY your way to mastery! Every Westie PLAYground features a central topic that the night will be planned around. This is a fluid topic and is only meant to set the stage, spark conversation, and create structure as needed. The group may decide to branch off and work on different elements. The Topic of the Night is the ice-breaker and the conversation starter. Topics may include connection, grounding, basic patterns, fundamentals, partnership, styling, musicality, dancer inspiration, and much more. These topics are influenced by the community and its needs. New and experienced dancers alike will benefit from this open-ended platform to learn, discuss, and practice. Beginners will focus on the basics of West Coast Swing, with the opportunity to practice and ask questions as challenges arise. Experienced dancers will have the opportunity to discuss topics, brainstorm solutions, practice with repetition, get supportive feedback, and more. You’re encouraged to bring new ideas, fancy patterns, videos, drills — and whatever else you’re excited about. Through practice, repetition, and experimentation, we’ll be able to build our new knowledge and confidence into our dancing habits. This is an open-ended segment where we may practice with partners and rotate, play “Westie Games,” work on drills, and more. Music will be available for you to work on integrating what you learned in a social dance environment. You are 100% encouraged to ask someone to practice with you (such as repeating a pattern, movement, drill, etc. ), ask for help, request feedback, and so on. The last and final segment is to let loose and have fun. Music and space will be available for people to “just dance” and test out their new skills as if they were at a normal social dance. Those that want to continue to practice are also encouraged to do so. Both are welcome. Westie PLAYgrounds, like any playground out there, are designed to give you the freedom to explore and stretch yourself so that you can have fun, find and exceed your limits, and challenge yourself to grow – while building your fellow Westies up. This event will have a casual, low-key atmosphere so that you’ll feel encouraged to ask questions, provide solutions, experiment in your dancing, and help your peers. An instructor will be available to guide the group through concepts, but the event is flexible enough to focus on the needs of the group. You’re encouraged to ask questions and contribute in ways you think will help the group or individual peers. Any skill-level is welcome. First timers and aspiring dancers are encouraged to attend a Westie PLAYground as their first experience – you’ll get your beginnings in West Coast Swing and learn the basics! Find upcoming Westie PLAYground dates to the side or at the fwWesties Facebook Page – Events. All of our current events are open to all skill levels. You do not need a partner or any prior experience to attend! We host our events at “The Anchor Room,” a large dance studio in Ossian, IN (about 15 minutes south of Fort Wayne). West Coast Swing is a style of swing dancing, a partnered social dance, that is danced within a slot to slow-to-moderate tempo music in the genres of Top 40s charts, R&B, blues, contemporary, Soul, and more. It is a highly creative and interactive style of dancing, where each dancer in the partnership has the opportunity to infuse their own personality and style, express what they hear in the music, and “play” with their partner. Learn more about West Coast Swing here, including a number of videos to help you find the “feel” of this incredible dance! Check out a few “styles” of West Coast Swing below … but remember, West Coast Swing is a highly versatile, customizable dance! No matter where you go, who you dance with, and what song you dance to … every dance will be unique! Learn more about West Coast Swing here! Learn More About West Coast Swing! Send an email to fwWesties@gmail.com or fill out the form below! The Fort Wayne Westies is a West Coast Swing club in the Fort Wayne, IN region, currently based out of the Anchor Room Studio in Ossian, IN. We host lessons, dances, and practices for dancers of all skill levels to learn, practice, dance, and socialize while immersed in West Coast Swing.